A two-year graduate business education at a top, private business school can be expensive. At SMU Cox, we want to make that experience accessible and affordable. Through generous support of our corporate and private donations and endowments, we are able to offer competitive scholarship packages to approximately 50 percent of our student body each year. Merit scholarships are awarded each year based on individual merit and achievement. Recipients are selected on the basis of demonstrated academic achievement, performance on the GMAT, professional experience experience, and leadership potential. All candidates who apply by March 1 (Round 3 deadline) are automatically considered for merit scholarships. Most students awarded merit scholarships meet or exceed the class averages for work experience, GMAT, and academic performance. Scholarships are awarded for the entire two-year period, subject to satisfactory academic performance. Candidates are evaluated and awarded during the admission process. To be eligible, candidates must submit their application, including all pieces (transcripts, GMAT, TOEFL, essays, etc. ), by the scholarship deadline of March 1, 2013 (Round 3 deadline). We strongly encourage students to apply in Round 1 (Nov. 15) or Round 2 (Jan. 15). The Cox School of Business is proud to partner with Forte Foundation to continue to increase the number of women pursuing graduate business education. We offer a variety of merit-based scholarship awards to admitted female students which qualify them to be named as Forte Fellows and become part of an exclusive group of top future female business leaders. All female candidates who apply by the Round 3 (March 1, 2013) deadline are automatically considered for Forte Fellows. The Cox Distinguished MBA Scholars Program awards up to 5 full-tuition scholarships per year to the most outstanding students admitted to the Cox Full-Time MBA program. The program is designed to enhance your business school experience through unique travel opportunities. Joined by your fellow scholars, you will participate in week-long career enhancing forums in New York City and Washington D.C.
Students with professional experience in marketing or advertising who plan to pursue a concentration in Marketing in the Cox MBA program may apply for the Marketing Scholars program. Selected scholars will receive a $10,000 scholarship ($2,500 per semester) during their MBA studies. 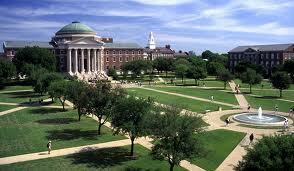 Demikianlah artikel mengenai Cox MBA Scholarships, SMU Cox School of Business, USA Semoga Bermanfaat Bagi Anda.